The exchange of rings to symbolise love and commitment has been a tradition that has existed for hundreds of years. And while it is common knowledge that engagement rings and wedding rings are two very different things, for those who do not have as much expertise in jewellery and adornments, the differences may not be so clear. Starting with the most distinguishable differences that many people are aware of, engagement rings are often presented to the female during or soon after a proposal. Typically, engagement rings feature a beautiful gemstone or diamond centrepiece, with an ornate band, and a range of elaborate settings and designs available to differentiate one ring from another. Engagement rings are often used as a way to signify the upcoming wedding - and were historically used as a way to symbolise the wealth of the man that is proposing, and therefore his ability to look after his future bride. Now, while that tradition has fallen wayside, the extravagance in the design of engagement rings have not - which is why we still often find the engagement rings to be more luxurious and distinguishable. 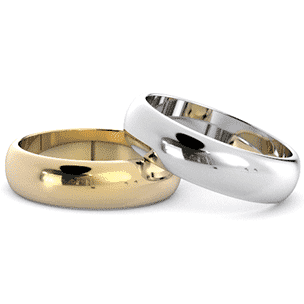 In contrast, wedding rings are usually exchanged between both the bride and groom during the wedding ceremony. While wedding rings or bands are often less intricate and decorative, they may still have pave stones or other basic settings. In varying cases, a matching wedding ring set might be preferred instead - but this is completely up to the couple on whether they want a matching set, whether they want to shop together or whether they want to individually shop for each other’s wedding rings. A deciding factor for the female’s wedding band is often the design of the engagement ring that was received during the proposal. If the engagement ring was extravagant, the wedding band is usually simpler - allowing both rings to be matched more nicely. 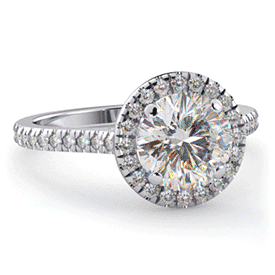 During the ceremony, the engagement ring is usually temporarily removed or moved from the left to the right hand. This allows the wedding ring to be placed at the base of the left ‘ring finger’ - as a time-honoured belief suggests that the wedding ring is the ultimate metaphor for eternal love, and as such should be worn closer to the heart. Following the wedding, the engagement ring would be placed above the wedding ring. Lifestyle - how often will it be taken off? Will you wear the rings separately or together?